First, it is a sign of good luck. In many cultures, wedding day rain is said to bring good luck and represents things like fertility, cleansing, unity, renewal and tears. Secondly, rain can be used to your advantage! An experienced all-weather photographer can capture gorgeous artistic photos with rain drops – really quite a stunning effect. You can also have a little fun with umbrellas props during photo sessions. 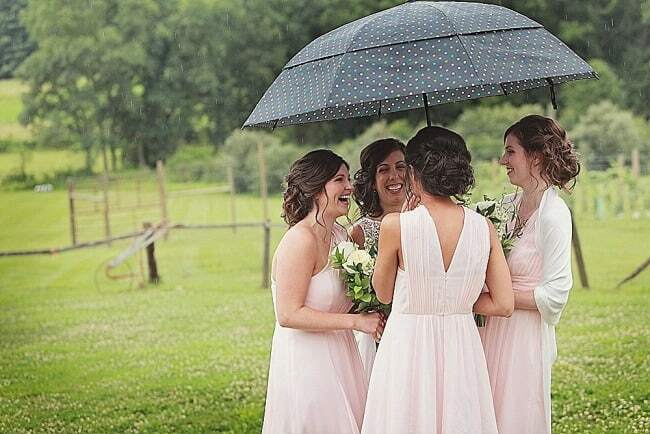 We have scoured our back catalogue of real weddings along with our bookmark favs to share cute wedding umbrellas you can have on hand come rain or shine. A wedding day shower can happen no matter where you live. Less so if you plan an elopement or destination wedding to Marseille in the south of France – one of the sunniest places in Europe! 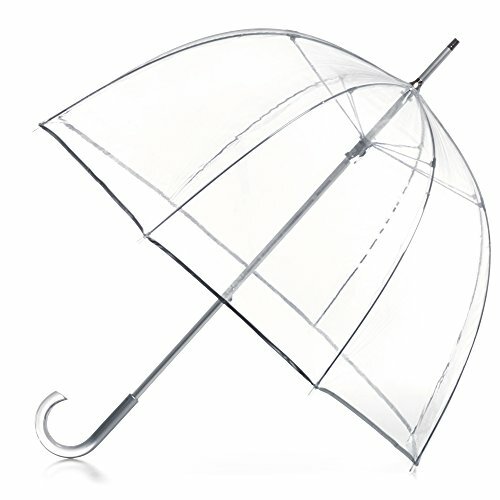 If the weather reporter says that this fall, winter, or spring season is going to be a bit wetter than usualy, make sure to plan ahead by purchasing a few classy clear umbrellas (like below). In fact, you can see that the real wedding couple below even bought wedding umbrellas for their bridesmaids. I love the fun photos that capture a intimate newlywed moments! 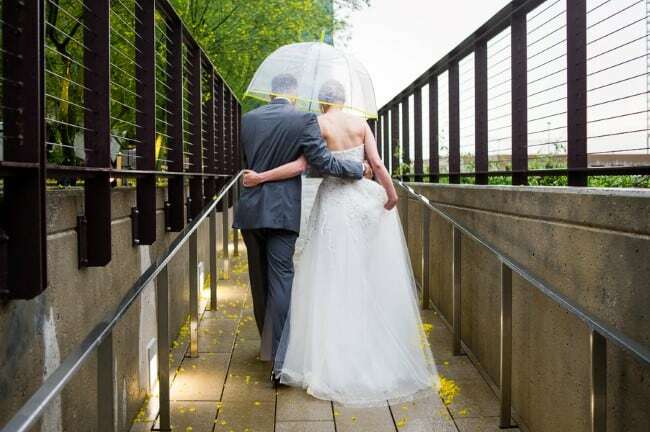 Even with rain you can still take great photos on your big day. 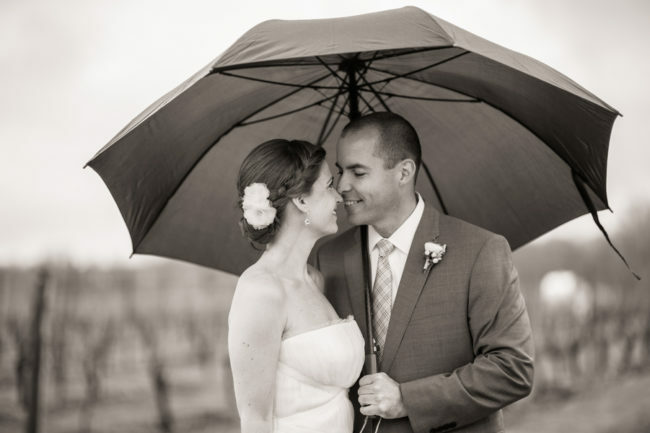 A clear umbrella lets you capture all the smiles and smooches! 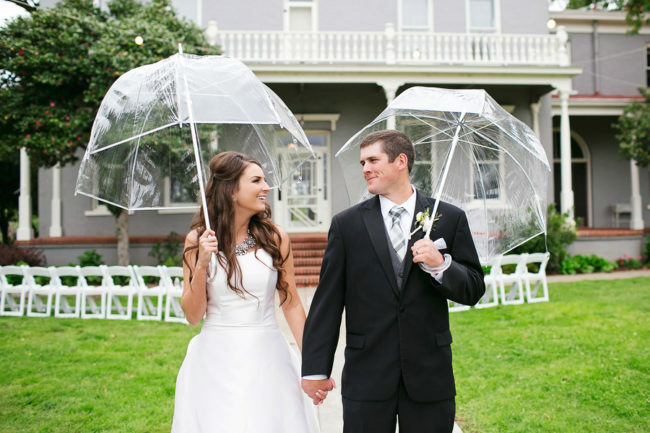 Purchase a bulk pack of white wedding umbrellas for both your ceremony and reception areas. Mother Nature can be temperamental at times. 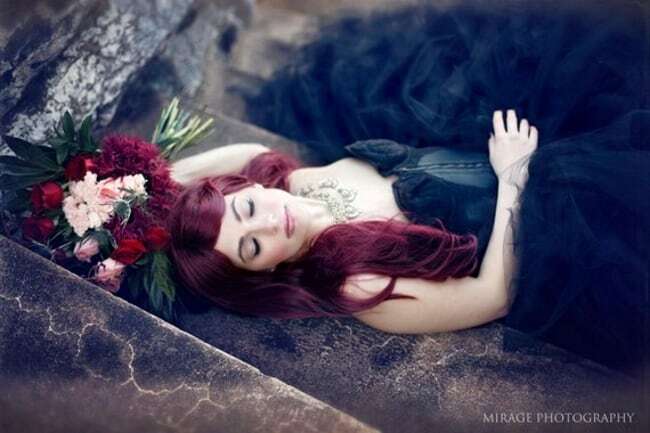 If she decides to change course and rain down upon your guests, at least they will stay somewhat dry. Although, I can foresee a scene that entails an all-out race to the woman’s bathroom in order to fix hair and makeup! This 10 pack of wedding umbrellas each come with a 60 inch umbrella span, auto open, and are made from Nylon and Polyester Fabric. 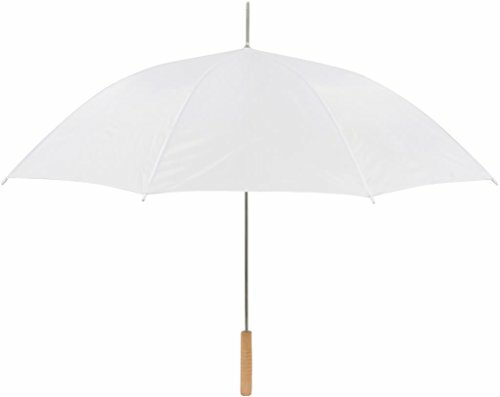 Clear umbrellas are perfect because you can hide underneath while still capturing great photos. 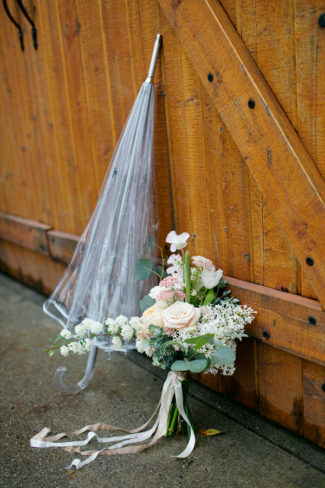 Why not incorporate your wedding colors with a clear umbrella? A colored trim adds a bit of pop. 35-in. Long Steel Sword Pole with Durable Plastic Hook Handle. 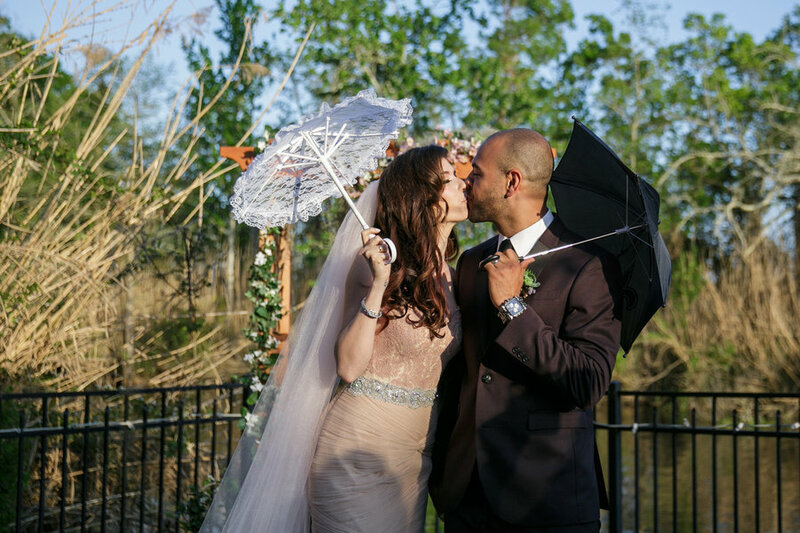 A pagoda parasol adds a little Asian flare to your wedding ​day. 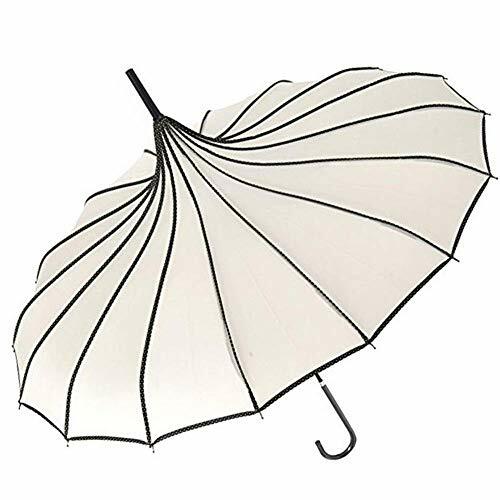 Nowadays, these elegant ​looking pagoda shaped umbrellas are popping up more frequently. 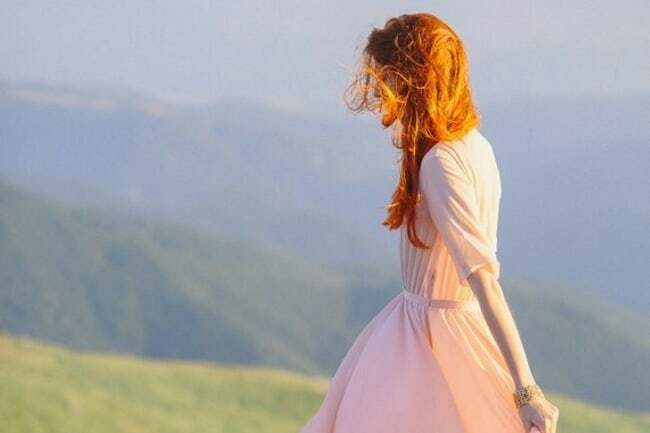 ​They still ​charm ​mainly as fashion umbrellas with their distinctive curved contours and pointed tops — so don’t plan to use them for any heavy rain! 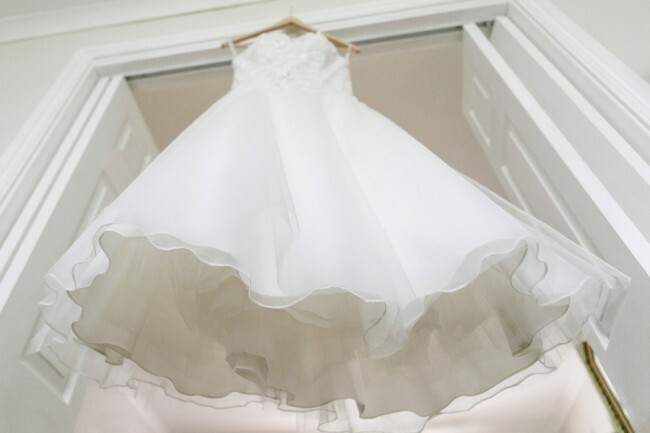 I can see how they would not be to certain bridal tastes or styles, yet I think they are quite pretty with their unique shape. Pagoda parasols come in many different colors, which means you can match and match to your overall wedding colors and vibe. Rather than mismatched bridesmaids dresses, why not mismatch your bridal accessories with an assortment of sweet, feminine, ruffle parasols. Who said you can’t wear black on your wedding day? 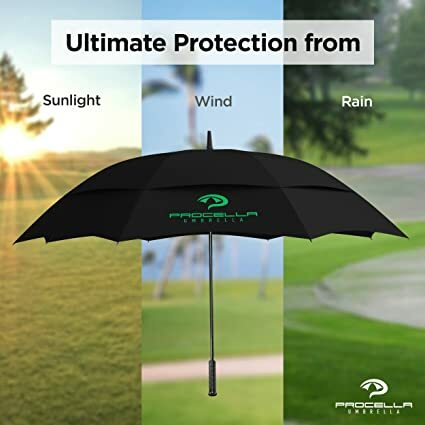 Okay, so technically you won’t be wearing black if you decide this ​highly rated windproof umbrella will do just the trick. 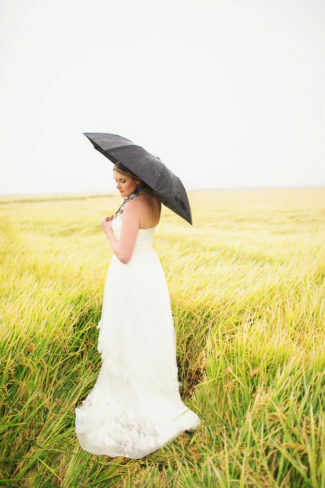 The contrasting dark umbrella with white wedding gown can make for some pretty photographs. 62 Inch large oversize windproof & waterproof umbrella. It has an automatic open and comes with vented double canopy, sturdy design and HIGHLY RATED on Amazon. Check it out. If a black umbrella is too sullen for your joyous occassion, lighten up the mood with some fun white polka dots! 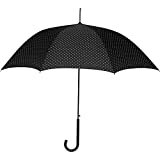 Polyester umbrella with Pinch proof closure to protect fingers and a plastic crook handle to hold onto. 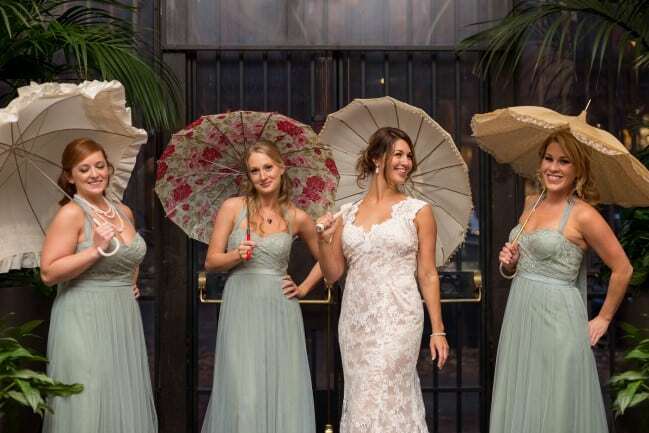 A warning with number seven on our list: a lace parasol is not going to keep you dry at all! 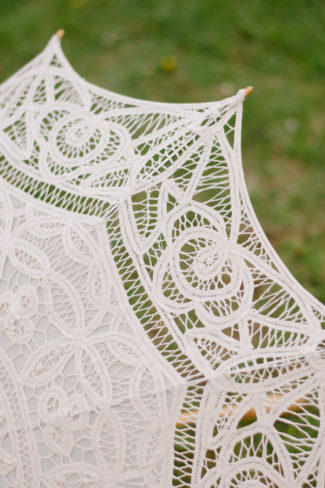 Vintage, lace, and 100% wedding worthy – the Battenburg Lace parasol are just too pretty not to add to my list. 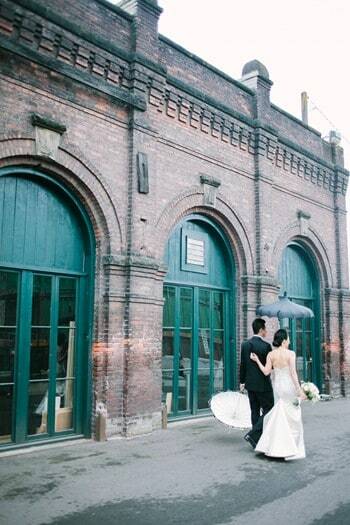 I would say this parasol is perfect as a sunny afternoon bridal accessory (see ​below). Diameter approx 31 inches (80cm). Length top to bottom 26 inches (66cm). Wooden handle with metal ribs. Not waterproof! ​I love a good geometric shaped wedding object – hearts even more so! 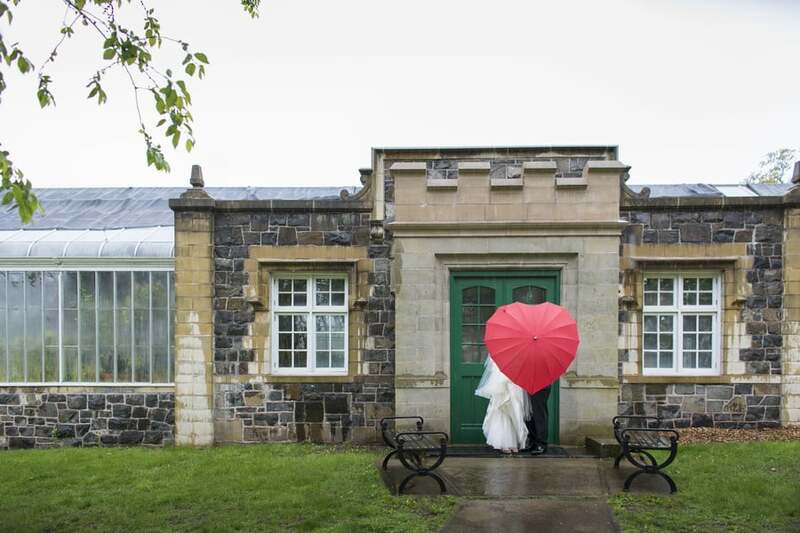 If choosing classic white is more appropriate for your wedding day, this fun heart shaped umbrella makes a nice addition. Add a bit of red color to go with your snazzy heart shaped umbrella. 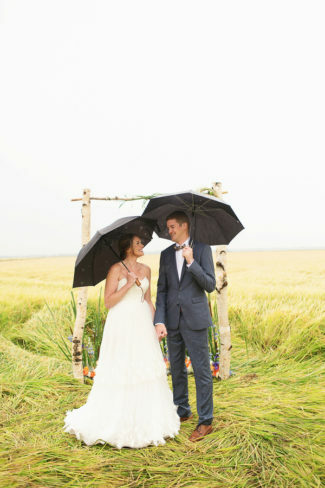 ​Another option is to use umbrellas or parasols as photo props at your wedding. 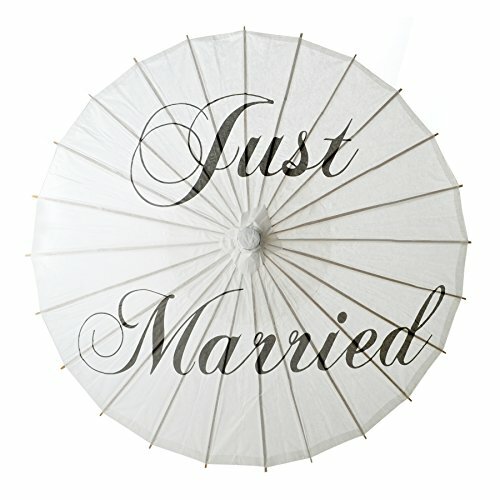 A paper parasol with “Just Married” written on it can make for a unique accessory. 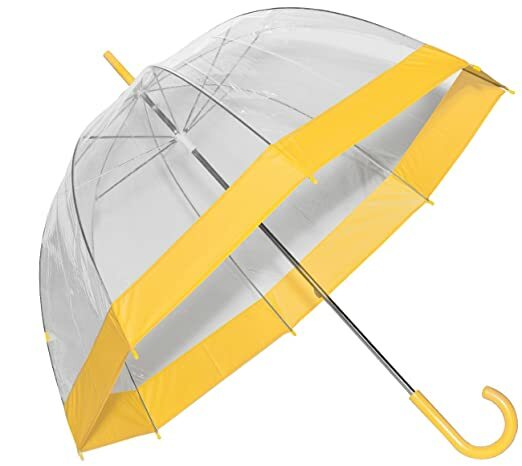 This is definitely a sunshine only umbrella not to be used in the rain! 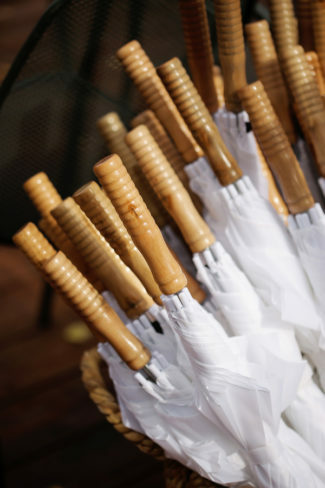 Depending on the weather, it is always a good idea to provide guests with parasols for shade from the sun or umbrellas to protect them from the rain. 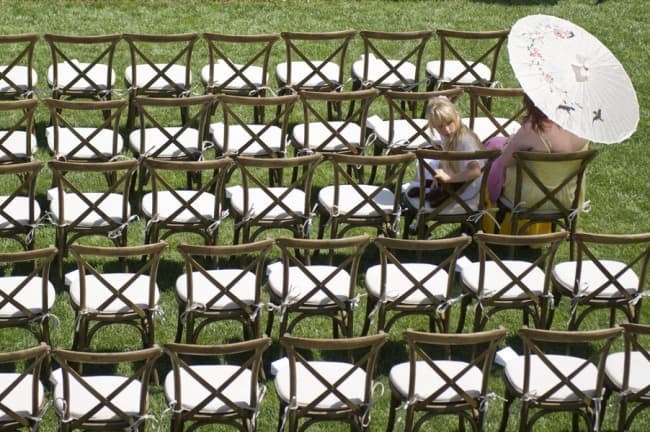 Here are a few ideas to keep your guests happy during any wedding weather mishaps. A gift that keeps on giving. 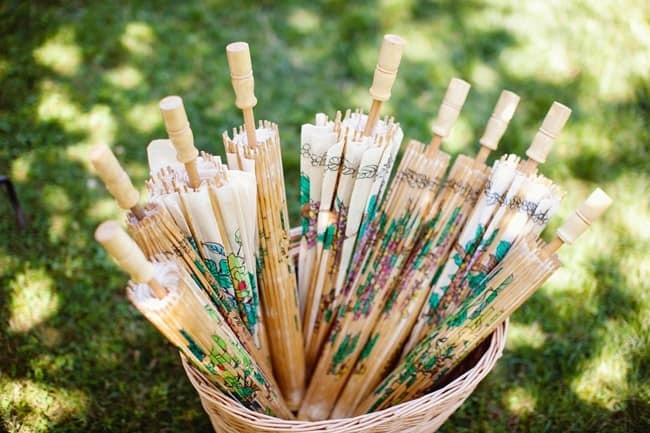 Offer your wedding guests a pretty paper parasol to protect themselves in the heat of the sun. 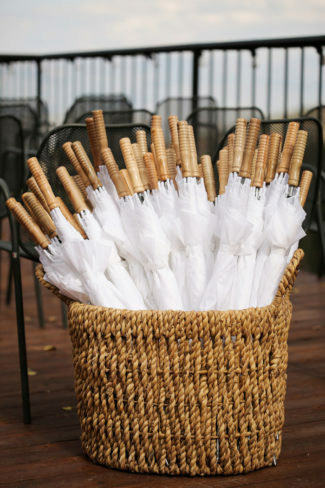 The parasol can double as a wedding favor that guests can take home and cherish. ​Like Getting Caught in the Rain? 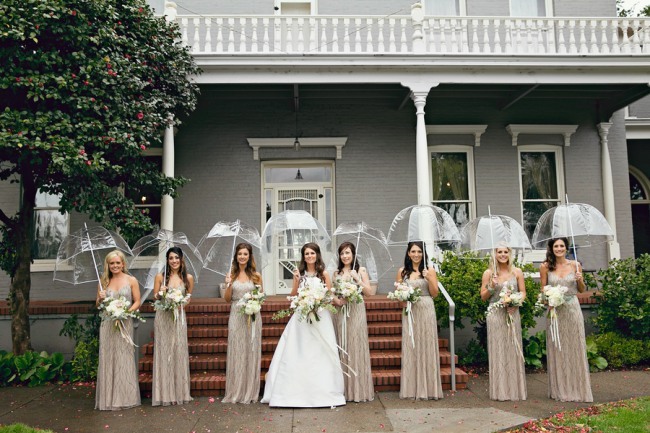 Make sure that you don’t get caught in the rain without a wedding umbrella, especially if you are planning to host a wedding anywhere on the Westcoast (Washington State, Oregon, British Columbia), Ireland, the UK, or in a climate that is known to have a shower or two. 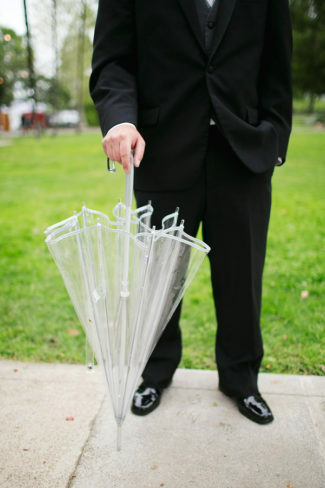 Purchase a classy umbrella ahead of time just in case your wedding day decides to bring you a sprinkle of good luck.